Plug it in and get ready to ride. 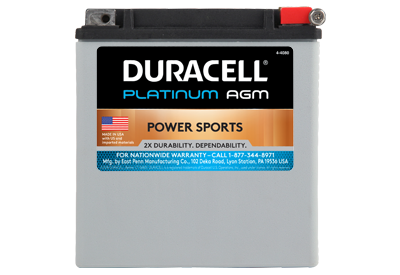 Convenience is the one word that best describes Duracell AGM Power Sports premium batteries. Factory charged with no adding acid is not just convenient, but delivers the high-powered, high performance that puts this battery in a class of its own. Motorcycles, ATVs, UTVs, Snowmobiles, and PWCs will benefit season after season from high starting and accessory power, longer battery life, and high vibration resistance.